As a profile of OAuth 2.0 that is complementary to OpenID Connect, UMA 2 defines RESTful, JSON-based, standardized flows and constructs for coordinating the protection of APIs and web resources. UMA 2 defines interfaces between authorization servers (AS), like Gluu, and resource servers (RS) that enable centralized policy decision-making for improved service delivery, auditing, policy administration, and accountability, even in a very loosely coupled "public API" environment. UMA 2 does not standardize a policy expression language, enabling flexibility in policy expression and evaluation through XACML, other declarative policy languages, or procedural code as warranted by conditions. UMA 2 inherits authentication agnosticism from OAuth. It concentrates on authorization, not authentication. 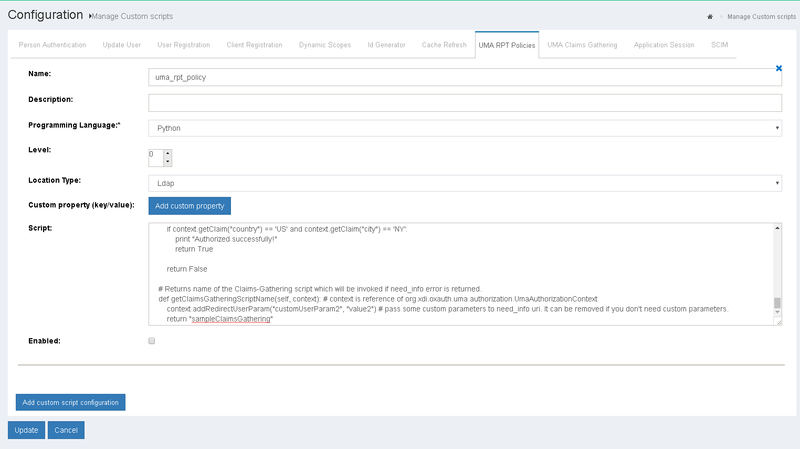 It has been profiled to work with OpenID Connect to gather identity claims from whoever is attempting access, and enables attribute-based ("claims" in OAuth2) authorization (with group-based or role-based policies a natural subset). Resource Owner (RO): An entity capable of granting access to a protected resource--the "user" in User-Managed Access. This is typically an end-user, but it can also be non-human entity that is treated as a person for limited legal purposes, such as a corporation. Resource Server (RS): A server that hosts resources on a resource owner's behalf, registers resources for protection at an authorization server, and is capable of accepting and responding to requests for protected resources. Authorization Server (AS)*: A server that protects, on a resource owner's behalf, resources managed at a resource server. * Gluu acts as an UMA AS. Learn more in the UMA 2 Core, Federated Authorization and Grant specifications. UMA 2 scopes are used to grant a client permission to do an action on a protected resource. Different scopes can grant access to the same action. For example, a "read" action can be allowed with scope "read" or "all". For some actions the Resource Server (RS) may want multiple scopes at the same time. For instance, a "read" action should only be allowed if the authorization request includes the "read" and "all" scopes. UMA 2 scopes are bound to resources and are used to fetch policies that check whether the specified user or client should have access to the resource. The scope JSON may contain custom properties. The scope endpoint has to be present in UMA configuration to make it discoverable. This section describes the process of adding UMA scopes in the Gluu Server GUI. Scopes are accessed by navigating to the UMA > Scopes in the right hand menu. Additionally there is an option to add authorization policy with the new scope. Resources protected by UMA 2 must be registered in oxTrust by navigating to UMA > Resources or via UMA-API. .
Resource access can be restricted by associated client with umaRestrictResourceToAssociatedClient oxauth configuration property. Associated client is array that is automatically populated with clientDn that creates it. UMA RPT Authorization policy's are associated with UMA scopes. An authorization request has a resource_id and scope(s). Each scope can point to one or more policies. If all policies associated with all scopes return true, then access is granted. For example, let's say we have the following resource, GET /photo. In order to access it the Resource Server (RS) requires the read scope to be present. If we have a policy that always return true, then any authorization request to /photo that includes the read scope will result in access granted. If we wish to have more sophisticated logic, for example to grant access only to a specific client, then we can add something like client_id = "@1111" to the policy. This means that an authorization request to /photo will only be granted if the scope includes read and is coming from client_id = "@1111". name: a human readable name to the UMA policy. The following section outlines how to define UMA RPT Authorization policies from the Custom Script menu. 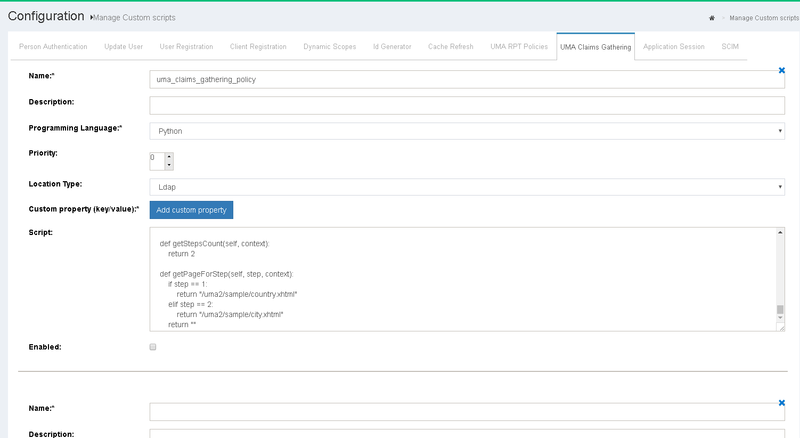 The Custom Script page is accessed by navigating to Configuration > Custom Scripts > UMA RPT Policies. #    from all scripts. If not all claims are provided need_info error is sent to RP. # 4. authorize() method is called if all required claims are provided. print "RPT Policy. Initializing ..."
print "RPT Policy. Initialized successfully"
print "RPT Policy. Destroying ..."
print "RPT Policy. Destroyed successfully"
# Returns required claims definitions. # This method must provide definition of all claims that is used in 'authorize' method. # Note : name in both places must match. context.addRedirectUserParam("customUserParam1", "value1") # pass some custom parameters to need_info uri. It can be removed if you don't need custom parameters. # Main authorization method. Must return True or False. print "RPT Policy. Authorizing ..."
# Returns name of the Claims-Gathering script which will be invoked if need_info error is returned. context.addRedirectUserParam("customUserParam2", "value2") # pass some custom parameters to need_info uri. It can be removed if you don't need custom parameters. Sometimes RPT Authorization Policy may require additional claims that has to be provided by the user. In this case Claims-Gathering Flow can be used to gather such information. The logic is coded as custom script and can be added by navigating to Configuration > Custom Scripts > UMA Claims-Gathering. # Main gather method. Must return True (if gathering performed successfully) or False (if fail). # Method must set claim into context (via context.putClaim('name', value)) in order to persist it (otherwise it will be lost). print "Claims-Gathering. 'country' is not provided on step 1." print "Claims-Gathering. 'city' is not provided on step 2." # client_id is specified via configuration attribute. # access Connect session attributes directly (no need to obtain id_token after redirect with 'code'). # To fetch attributes please use getConnectSessionAttributes() method. print "User is not authenticated. Redirect for authentication ..."
authorizationUrl = context.getAuthorizationEndpoint() + "?client_id=" + clientId + "&redirect_uri=" + redirectUri + "&scope=openid&response_type=code"
UMA policies protect resources based on scopes. If a scope is protected by a policy, then the policy script must reutrn true in order to authorize access during RPT authorization. Multiple policies can protect a single scope. In such a case, all the policies must retun true to authorize access or else access will be denied. UMA 2 is regular OAuth 2 Token Endpoint. Therefore it support all client authentications then in regular OAuth2/OpenID Connect. However there is one special client authentication method which is using access_token obtained by user to authenticated the client. Means client that was used during user authentication is used for client authentication. Of course access_token must be valid. UMA 2 Scope expressions is Gluu invented extension of UMA 2 which gives flexible way to combine scopes and thus propose more robust way to grant access. Below is example of including all scopes except http://photoz.example.com/dev/actions/all scope (because for this part of expression false is returned). Please note that it is not possible to update existing RPT at Token Endpoint if rpt_as_jwt=true for client since JWT has to be re-generated to encode new permissions. Therefore RPT as JWT is generated if existing RPT is not provided (at rpt request parameter) during requesting RPT at Token Endpoint. RPT as JWT is signed with algorithm set by access_token_signing_alg client property or otherwise if it is not set then by defaultSignatureAlgorithm oxauth configuration property. If you need to secure apps with OpenID Connect RP and UMA 2 RS code, you might want to take a look at our oxd client software. Learn more about the Gluu Server's UMA-API.